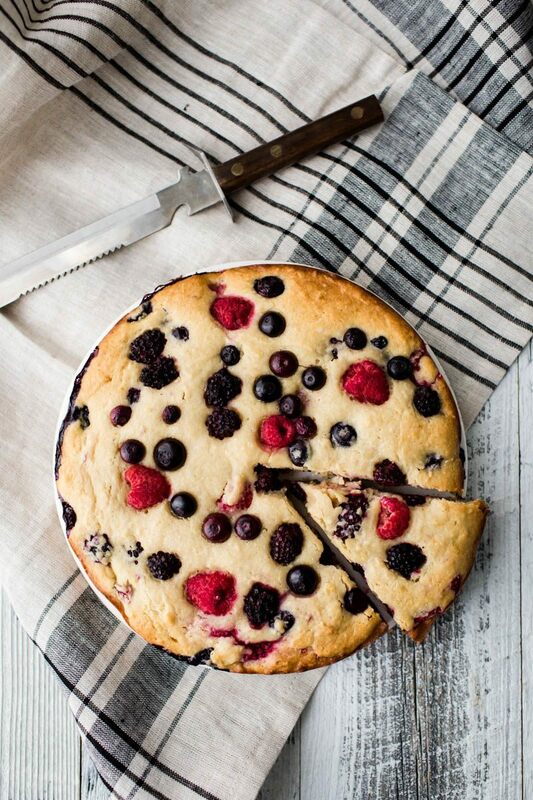 Ricotta Cake with Mixed Berries | Naturally. A rather short post as we head into the holiday weekend. I ended up staying Illinois for a week longer than I intended, but we’re on our way back to California today. Mack has been such a trooper through the whole process and I’ve taken away one thing: this little boy loves to be out and about. This time away has also helped me bring focus to what comes next in terms of work and this site. I have a few personal projects I’m excited to focus on and hopefully in the not-to-distant future, I’ll be sharing with you what they are. In the meantime, there’s ricotta cake. I stumbled upon this cake in one of the recent issues on Bon Appetit. The thought of ricotta cake sounded amazing and akin to my favorite beet cake– rich and moist. They call for frozen berries but as you can probably tell from the image, I used fresh. And then a few days after testing this cake, I made a fresh peach version (also good, I just thought the berries made for a nicer looking cake). I worked this recipe a few times and after a few trials with trying to account for the maple syrup, I went back to their recipe and just upped the flour slightly and it worked wonderfully. Preheat oven to 350˚ and line a 9″ cake pan with parchment paper then spray with nonstick oil (I prefer coconut oil). In a small sauce pan,melt the butter and maple syrup together, set aside to cool. In a bowl, combine flour, baking powder and salt. In a separate bowl, whisk together the ricotta, eggs, and vanilla extract. Fold into the dry ingredients until just combined. Repeat the folding process with the butter/maple syrup mixture, being careful to not over work the batter. Finally, fold in 1 cup of the fresh berries. Pour batter into prepared pan and sprinkle with remaining 1/2 cup berries. 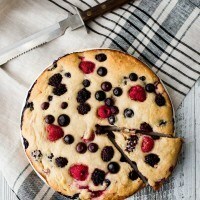 Take a spatula or spoon and lightly press the berries into the top of the cake. Bake the cake for 50 to 60 minutes. The cake should be golden and have a knife come out clean when inserted into the middle. Let the cake rest for at least 20 minutes before removing from the pan. +Flour: While I got the best results using the unbleached all-purpose flour, I did also enjoy using whole wheat pastry flour and even a sprouted spelt flour. If you’re feeling adventurous, play around with the flour combination. +Ricotta: If buying store-brand ricotta, you most likely won’t need to drain it. However, if you’re using fresh or homemade ricotta, drain the excess liquid from the ricotta my placing it in cheese cloth over the sink in a strainer and allowing to drain for 30 minutes. +Berries: The original recipe called for frozen berries, which creates a slightly nicer swirl pattern on the top. You can always freeze fresh berries (or just use frozen) but I usually forget. Couldn’t wait to make this, so went out and got ricotta. When mixing, the batter smelled amazing. In the oven, smelled amazing. And the taste… AMAZING. LOVE THIS. Not overly sweet. Nice tart berries. Perfect. Thank you! Delicious! I didn’t have enough berries, so I added some peaches I had previously frozen. The only problem with this cake is it was gone too quickly! That looks like a perfect, everyday, end of summer cake. I hope you enjoyed Illinois! Looks like the perfect cake for an afternoon tea! 🙂 I’m thinking of subbing the ricotta with my very own homemade ricotta from skim milk when I try this recipe. A nice simple cake. Looks yummy. I hope you enjoyed Illinois. A cake like this is one of the best ways to eat summer berries. So good and so easy. What could I use as a substitute (if anything) for the eggs? My son is allergic but I know he’s LOVE this ricotta cake. Any suggestions? Thanks! Thank you for this wonderful recipe! I made it this past Sunday and love it. I used fresh fruits also and really enjoyed the true taste of berries. I love your recipes! Keep up the great work!! I’ve made this recipe twice now, and both times it’s been delicious. However, the second time I used frozen mixed berries that included some strawberry pieces. DO NOT DO THIS. While the cake is cooked through, the strawberries just completely disintegrated into goo, and there are little blobs of strawberry gunk throughout the cake where they were. Still tastes great, but the blobs are not great to look at and give the appearance of the cake being underdone. I would recommend being sure to stick to blackberries, raspberries, and blueberries. Maybe cherries. That is so good to know! I bought a bag of frozen mixed berries for this and was just reading through comments before beginning and wouldn’t have thought twice about the strawbs–I’ll be taking them out of the mix!! Can I use molasses instead of maple syrup, because it is hard to find maple syrup in Turkey. You could but it would definitely change the flavor. You might check the original recipe and use sugar. Hello Erin! The cake looks great! Do you think it would work with gluten free flour? Thank you! I do- if you have a solid flour mix you like to use, I’d say go for it. Another option is using Bob’s Red Mill 1:1 flour!